Artists need to bring their own supplies, equipment and a chair to the festival. Sept. 15 between 2 and 4 p.m. for a juried exhibit. The exhibit opens on Friday, Oct. 5, 6 - 8 p.m. and runs until Dec. 7. $100 Best in Show will be awarded at the Opening Reception. Open media. No size restrictions. Art must be able to be hung by nails or magnets – no framing is necessary. 26315 Heritage Lane, Courtland, VA 23837. For more information on the Heritage Days Festival, call (757) 653-9554. 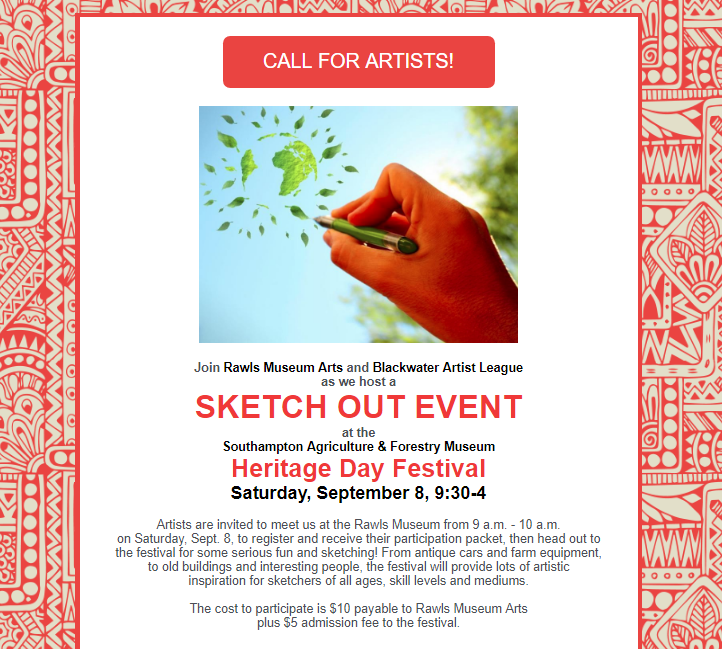 For information on the Sketch Out, email Museum Director, Leigh Anne Chambers at Leighanne@rawlsarts.com.